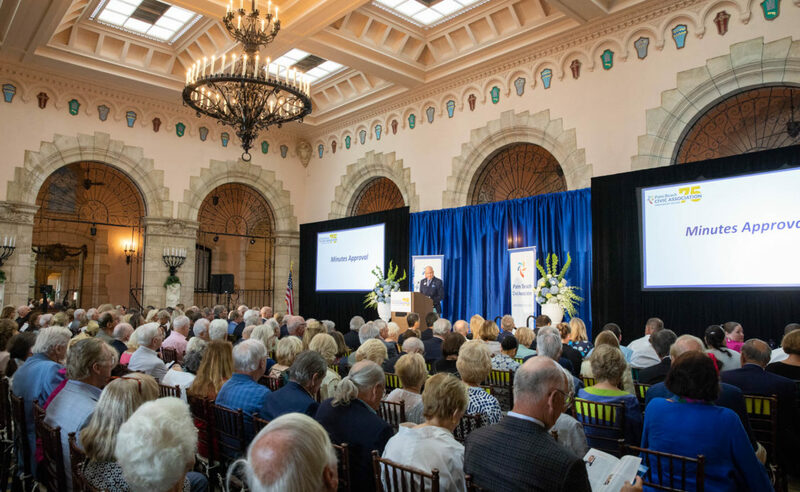 The Civic Association held it’s Annual Meeting at the Flagler Museum on Monday, April 15, 2019. 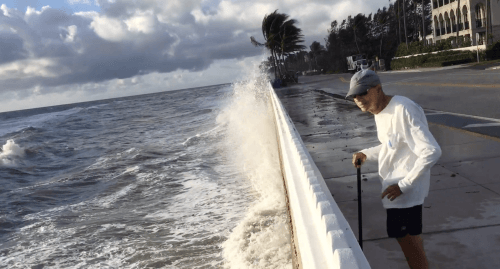 History of the Palm Beach Civic Association – The First 75 Years documentary was shown. Stay tuned for all the news about this event this week. Thank You for a Magnificent 75th Season! It all started in 1944, when a handful of civic minded Palm Beach residents formed the association. Their mission – then and now – is to preserve, protect and enhance the quality of life on the island. Beach erosion, gambling, port expansion and inlet deepening were among the major issues of the association in the early days – concerns that remain front and center today. Other issues in the first two decades were: water pollution, sewage disposal, zoning, taxes, parking and lack of airline flights. Alexander H. Rutherford as president, Joseph F. Gunster and Page Hufty as vice presidents, and John L. Volk as secretary-treasurer led the association the first year. They established a temporary office in the Wyeth Building, and the following year moved to 273 S. County Road. Page Hufty became acting chairman of the executive committee, Alfred G. Kay president, and Frank M. Hannon executive secretary. After the letter was reported in the Palm Beach Post, the Beach Club founded by ER Bradley closed. It was a well-known private restaurant and gambling establishment that operated for almost 50 years from 1898 to 1945. In February 1948, Palm Beach voters approved a beach erosion bond issue as town officials promised no increase in taxes. The following month, the Civic Association issued a statement that it was opposed to relaxing zoning restrictions. The residents don’t want the town to change into “an overcrowded commercial resort,” the statement said. 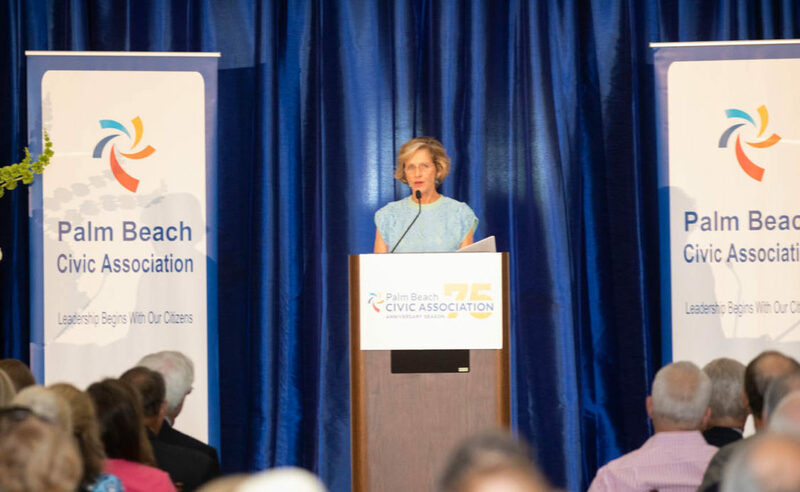 In the 1950’s, 60’s and 70’s, the Civic Association continued to fight beach erosion and vocally opposed increasing taxes, expanding commercial growth, and deepening the inlet at the Port of Palm Beach. All are issues and positions that remain today. In the 1960’s, the Civic Association ramped up its fight to oppose port expansion and inlet deepening. In 1965, the association paid $3,300 for a study on the $5.6 million deepening project at the Port of Palm Beach. The study showed that the work is not justified. The association’s concerns were that the deepening project will damage marine life, cause flooding, and attract undesirable industries. In 1974, the county’s legislative delegation approved a new charter for the Port of Palm Beach forging a temporary truce between the port commission and the Civic Association over expansion. From the beginning, the association’s fight to keep taxes in check was a priority. In 1978, the Civic Association filed a class action lawsuit, fighting for fairness and uniformity in the county’s method of appraising property for tax purposes. In Dec. 1980, President Jimmy Carter signed legislation that took the ownership of Mar-a-Lago out of the hands of the federal government and reverted ownership to Marjorie Merriweather Post’s Hillwood Foundation. Mrs. Post willed the estate to the federal government for use as a vacation home for presidents and a guest house for visiting heads of state. Her plan never materialized because security was deemed inadequate. The Civic Association was against making the 115-room mansion into a museum or any public entity. Doyle Rogers, president of the association, said the best use would be for someone to buy it and use it as a single-family residence. Civic Association Director Nancy Brinker, founder of Susan G. Komen, said she believes the association is crucial to the quality of life in Palm Beach. Ms. Brinker was U.S. Ambassador to Hungary and U.S. Chief of Protocol under President George W. Bush. Over the years, the Civic Association has kept residents informed on issues that affect them and their quality of life. Among them: public safety, government spending, traffic, infrastructure, parking, taxes, air traffic noise and proposed runway expansion, elections (town, state, national and ballot questions), West Palm Beach development, Palm Beach development and growth, healthcare, transportation, undergrounding utilities, water quality, terrorism, and presidential visits. Gone are the monthly printed Community Bulletins and news clippings in the mail during the off-season. 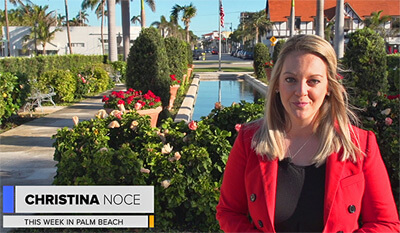 Now The Civic Association capitalizes on instant technologies like the web, email, and social media – including our weekly video newscast, Palm Beach TV and our e-newsletter: This Week in Palm Beach. Throughout the decades, the Civic Association always had strong leaders at the helm. Among them: Page Hufty, Alfred G. Kay, Raymond J. Kunkel, Harold B. Scott, Louis C. Pryor, Doyle Rogers, George Matthews, William Guttman, and Stanley M. Rumbough, Jr.
Today the association is led by Mr. Wright as chairman and CEO; Pat Cooper as treasurer and Ned Barnes as president, along with a 130-person board of directors. Membership has grown to more than 1,800 men and women. Among the major programs and awards sponsored by the Civic Association are the State of the Town Address and Annual Meeting, Town Employee of the Year Award, Scholarship Award for Children of Town Employees, Kunkel Foundation Awards, and the Bill Brooks Community Service Award. The organization continues to embody the principles the Civic Association was founded on 75 years ago: taking proactive stands on civic affairs; working closely with local, state, and federal officials; informing the public; and encouraging citizen involvement in preserving the quality of life in Palm Beach. To join this dynamic organization, click here to become a member today! April 8, 1944 PB Post: The Palm Beach Civic Association filed its charter. The organization was formed to promote the interests and welfare of Palm Beach. Alexander H. Rutherford is president; Joseph F. Gunster and Page Hufty, vice presidents, and John L. Volk, secretary-treasurer. Temporary offices were established in the Wyeth Building. Dec. 11, 1945 PB Post: Frank M. Hannon, was named executive secretary of the Civic Association. Alfred G. Kay was president. The first membership meeting of the association was held in December. 1945, the annual meeting in February 1946 and the last meeting of the season in March 1946. The association offices were opened at 273 S. County Road. Jan. 14, 1947 PB Post: The Civic Association holds its first membership meeting on Jan. 13, 1947 with 218 regular members and 63 sustaining members. Issues discussed: zoning; beach erosion; lake pollution and sewage disposal. The association was in favor of enforcing strict zoning that limits building of hotels and apartments and will keep Palm Beach a community of residential homes. April 12, 1947 PB Post: The Town of Palm Beach is referred to as “Resort Council: in newspaper articles. Alfred Kay voiced approval to the Town Council for adopting a new zoning ordinance establishing the right to have parking meters and to levy a utility tax as of April 20. Feb. 18, 1948 PB Post: In response to a request from the Civic Association and Palm Beach Town Council members, County Commissioners delay dredging operations south of the Sloane estate until late spring after seasonal residents leave. The seasonal residents complained that the dredging interfered with their use of the beaches in that area. Feb. 25, 1948 PB Post: Voters approve a beach erosion bond issue. The project is expected to begin the summer of 1949. Officials have promised no increase in taxes. March 7, 1948 PB Post: The Civic Association issued a statement putting itself on record as opposing changes in the zoning laws established the previous year. This was in response to “a score of applications filed asking relaxation of zoning restrictions in almost every area of the town.” The property owners of Palm Beach should not be forced to spend a great deal of time and money every year to defend and protect their interests against encroachment,” the statement said. The residents don’t want the town to change into “an overcrowded commercial resort,” it said. March 30, 1948: The Civic Association winds up the season with Aksel Wichfeld reporting 324 active members. William G. Cluett, new chairman for beach erosion, advocated further investigation on responsibility for the upkeep of groins. Dec. 23, 1948 PB Post: The Civic Association writes to the town’s and county’s law enforcement agencies mentioning “frequent and disturbing” rumors regarding possible organized gambling in the “resort” and that they are “unalterably opposed” to gambling in town. Dec. 3, 1948, the Civic Association board of directors passed a resolution opposed to any and all forms of gambling with the town. Feb. 6, 1951 (Tues) PB Post: In a political ad, the Palm Beach Civic Association urged every qualified voter to cast their votes in the municipal election on the same day as the ad ran. A mayor and two councilmen were up for election. March 19, 1952 PB Post: The Palm Beach Civic Association will hold its final meeting of the season on March 24. The topic of discussion will be traffic and parking. Jan. 18, 1955 (Tues) Palm Beach Post: The Palm Beach Civic Association voted unanimously against keeping Palm Beach Air Force Base in the area and opposed a proposed oil refinery from being built near Military Trail west of Riviera Beach. The association suggested that the County Commission rezone the proposed site to keep the refinery out, citing concern about fumes from a large oil refinery. Frank Quigley, chairman of the port committee, cited opposition to any jetty extension and channel deepening at the Palm Beach Inlet and advised that the association send representatives to make their case to the U.S. Army Corps. of Engineers and to Congress if need be. “Our directors feel that we should do all we can to maintain the channel as it is now and limit the size of ships to the prevailing tonnage transiting the inlet,” said President Alfred G. Kay. James E. Hollingsworth reported that the new parking meters along Ocean Blvd. should bring in an estimated revenue of $15,000 annually. The association endorsed a $400,000 beach erosion proposal. The association has 435 members. March 28, 1955 (Sun) PB Post: The Civic Association will hold its final meeting of the season on Monday. Nov. 2, 1958 PB Post Times: The Civic Association moves its office to the second floor at 319 Royal Poinciana Plaza. March 4, 1961 (Sat) PB Post: The Palm Beach Civic Assn opposed a proposal re-zoning property south of the Coral Beach Club from residential to apartments. The Zoning Commission recommended that the application be denied. 1962 – At the urging of the Civic Association, the town adopts guidelines for charitable solicitation that required an organization to disclose in a sworn application: names of its officers and directors, where and for what purpose the funds would be spent, what percentage went to paid promoters and solicitors; estimated cost of the ball and estimated percentage of proceeds to be spent in Palm Beach County. March 28, 1962, (Weds) PB Post: The Civic Association opposes a zoning change from single family residence to multiple family residence on South Ocean Boulevard. The Town Council denied the change. Jan. 22, 1963 (Tues) PB Post: The Civic Association urged the Town Council to take immediate action on beach erosion and included a proposal that part of the cost be assessed against owners of the private portions of beach involved. They also called for a plan using any available county, state or federal funds. The association also recommended that groins be used in any beach restoration project. The chairman of the beach erosion committee said any sand used to restore the beaches would be wasted without groins to hold it there. May 15, 1963 (Wed.) PB Post: The Civic Association thanks the town for keeping the millage rate the same as the past five years – 18 mills. Oct. 31, 1963 (Thurs) PB Post: The Civic Association opposes the school board’s request for a five-mill tax increase for new schools. The association favors a bond issue. March 31, 1965 (Weds) PB Post: A study on the $5.6 million deepening project at the Port of Palm Beach says the work is not justified. The Civic Association paid $3,300 for the study. The association says the deepening project will damage marine life, cause flooding and attract undesirable industries. May 19, 1965, (Weds) PB Post: The House Appropriations subcommittee in Washington heard arguments on the continued deepening of the Palm Beach Harbor and Turning Basin. The Civic Association opposes the project. May 26, 1966 (Thurs) PB Post: The immediate past chairman of the port commission says a delay in taking bids for a deepening project will cost thousands of dollars. He said the Civic Association was causing the delay. April 8, 1967 (Sat) PB Post: The Civic Association opposed a one-mill tax increase by the port for a $4.5 million improvement program for Peanut Island to accommodate government and private oceanographic research groups who want to relocate there. April 30, 1967 (Sun) PB Post: C. Markham Langham, chairman of the Port of Palm Beach Commission, resigned his long-time post as a director of the Civic Association. He said his resignation was requested by association President Paul Fentress. On April 21, Mr. Langham voted with the other two commissioners in seeking a new charter for the port, which the Civic Association opposes. The association reported 734 members at that time. May 7, 1969 (Weds) PB Post: The Civic Association has notified the county’s legislative delegation that it is not opposed to a new charter for the Port of Palm Beach if it meets certain criteria. The association listed the following criteria: no increase in the taxing power of the port authority; acceptance of all local zoning ordinances; a ban on heavy industry on the port’s property; a ban on any bridges on port property without approval of the municipalities involved; a requirement that port bonds be sold at public auction. May 15, 1969 (Thurs) PB Post: Civic Association Chairman Raymond J. Kunkel and President Paul L. Fentress wrote to members urging them to protest efforts to mine limestone in Lake Okeechobee. March 14, 1970 (Sat) PB Post: The Civic Association and others want to invalidate a 99-year lease on Peanut Island by Peanut Island Properties, Inc., because they fear an oceanography study by the lessees will lead to high-rise development. March 8, 1972 (Weds) PB Post: The Civic Association contributes $5,000 to fund radio and TV ads urging the defeat of an amendment that would eliminate the various municipal courts in the county and consolidate the court system. July 11, 1973 (Weds) PB Post: A representative of the Civic Association told port commissioners the association objects to a proposed $1.2 million expansion at the port facilities in the area formerly known as Layton Park. Nov. 30, 1973 (Fri) PB Post: Port of Palm Beach commissioners indicated they are willing to compromise on some controversial issues raised by opponents of the port’s proposed new charter. The Civic Association and some environmental groups oppose portions of the charter. One major sticking point is the proposed construction of a third slip in the area formerly known as Layton Park, owned by the port. March 6, 1974 (Weds) PB Post: The county’s legislative delegation approved a new charter for the Port of Palm Beach forging a temporary truce between the port commission and the Civic Association over expansion. At the urging of the Civic Association., the new charter requires the commission to submit its books to an independent audit. Two amendments, crafted by the Civic Association to limit the port’s growth, are still under consideration by a delegation subcommittee. March 11, 1974 (Mon) PB Post: The Civic Association opposes term limits for elected Palm Beach officials. Sept. 26, 1974 (Thurs) PB Post: The Civic Association backed the idea of creating a unified transportation authority in the county that will have taxing power and include the airport, inlets, Port of Palm Beach and the bus system. Feb. 5, 1975 (Weds) PB Post: The proposed amendment to the town charter limiting elected officials to consecutive terms of six years was soundly rejected 1,655 to 987. The Civic Association opposed it. Feb. 15, 1975 (Sat.) 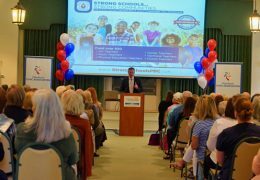 PB Post: Civic Association President Raymond J. Kunkel said Palm Beach ought to petition the legislature for a separate school district if the School Superintendent Joseph Carroll carries out his threat to close Palm Beach Public School as one way to reduce next year’s school budget by $7.4 million. Mr. Kunkel said Palm Beach can operate a fine school in Palm Beach for the $5 million in taxes its residents send to the county. Feb. 19, 1975 (Weds) PB Post: School Board member Ted Brown assured Palm Beach residents, who protested the possible closing of Palm Beach Public School, that a majority of school board members are voting against closing the school. The Civic Association opposed closing the school. Nov. 13, 1975 (Thurs) PB Post: The Town Council told a developer he could not move a rare Mysore fig tree protected by the town’s tree ordinance. The Civic Association and the Palm Beach Garden Club protested moving the fig tree, citing esthetic and environmental issues. Nov. 26, 1975 (Weds) PB Post: Civic Association members asked state Department of Environmental Regulation officials for an environmental impact study of the port’s request to dredge about 10 acres north of the port. State and federal agencies have said such studies are not necessary for the project. Jan. 7, 1976 (Weds) PB Post: The Florida Department of Environmental Regulation has delayed action on a dredging permit at the Port of Palm Beach because the Civic Association fears the dredging may increase the likelihood of an oil spill. March 4, 1976 (Thurs) PB Post: Raymond J. Kunkel, chairman emeritus and a driving force behind the Civic Association, dies at 74 years old. He campaigned for the purchase of the Par Three Golf Course, urged stricter enforcement of the zoning code, and adamantly opposed proposals to expand the Port of Palm Beach and to limit tenure for elected town officials. June 20, 1976 PB Daily News: The Civic Association. and the recreation department plan a Bicentennial Litter Clean-Up Contest for children ages 10 and up to remove trash from the beaches and other public areas. Nov. 10, 1976 PB Daily News: The Civic Association joins with the town and the Palm Beach Merchants Association in opposing Bonwit Teller opening its Worth Avenue store on Sundays during the Christmas shopping season. April 22, 1978 (Sat) PB Post: The Town Council voted down the donation of a million-dollar recreation center to the town because some councilmen declined to approve a swimming pool that was an integral part of the facility. The Civic Association supported the donation by Mrs. Leon Levy in memory of her mother. July 7, 1978 (Fri) PB Post: Port commissioners voted unanimously to sell Peanut Island to the state for $1 million. George McCurrach, chairman of the Civic Association, said he thought the commission did the right thing. Oct. 29, 1978 (Sun) PB Post: The Civic Association and the Citizens Association of Sloan’s Curve join in a class action lawsuit against the county’s property appraiser, tax collector and head of the state Department of Revenue. They are asking for fairness and uniformity in the county’s method of appraising property. Dec. 19, 1978 (Tues) PB Post: The Palm Beach Paramedics’ Association won the first annual Raymond J. Kunkel Award from the Civic Association for outstanding service to the town. A $3,000 check and a plaque were awarded. Sept. 9, 1979 (Sun) PB Post: The Civic Association joins with the Citizens Association and the Concerned Citizens Against Aircraft Noise and Air Pollution, Inc. in opposing a $43 million expansion of Palm Beach International Airport. Feb. 19, 1980 (Tues) PB Post: Doyle Rogers and George Matthews were elected as the new president and chairman respectively of the Civic Association. Mr. Rogers said the objectives of the 2,300-member group will remain the same. The association backed a storm drainage bond issue that was approved overwhelmingly. The organization has supported a new town charter and opposed construction of oil storage facilities at the Port of Palm Beach. The group also opposed “piecemeal” reassessment of properties in Palm Beach. April 8, 1980 (Tuesday) Palm Beach Post: Town Manager George Frost gave his State of the Town address to 150 members of the Palm Beach Civic Association. He has delivered an annual report to the “influential civic group” for the past 12 years. The town has spent $4.2 million – about 40 percent of its operating budget – on police, fire and medical services, Mr. Frost said. The rescue unit made more than 1,200 runs and a second vehicle is being added. “The cost of government will continue to go up as long as inflation continues to go up,” he said. In recent years, Palm Beach spent $5.5 million to help build a regional sewage treatment plant. It will cost the town $1 million more this year than it would have if Palm Beach continued to discharge directly into the ocean. It was a good decision, but an expensive one, he said. The town’s new commercial zoning plan will help control the spread of regional commercial areas in town, Mr. Frost said. Mr. Frost said the salaries of police patrolmen need to be increased. The council has provided $250,000 in seed money toward an $800,000 recreation center, but is looking for private donations as well. Dec. 24, 1980 (Weds) PB Post: President Jimmy Carter signed legislation that took the ownership of Mar-a-Lago out of the hands of the federal government and reverted ownership to Marjorie Merriweather Post’s Hillwood Foundation. Mrs. Post willed the estate to the federal government for use as a vacation home for presidents and a guest house for visiting heads of state. Her plan never materialized because security was deemed inadequate. The Civic Association is against making the 115-room mansion into a museum or any public entity. Doyle Rogers, president of the association, said the best use would be for someone to buy it and use it as a single-family residence. Sept. 11, 1981 (Fri) PB Daily News: During a meeting of the Palm Beach Chamber of Commerce, State Attorney David Bludworth praised the Civic Association for its crime prevention participation. Oct. 1, 1981 (Thurs) PB Daily News: The town’s 1981-82 budget, proposed at $18.7 million and $2 million higher than last year, is expected to be tentatively approved. The Civic Association has suggested the town try to reduce the budget and millage rate further. April 19, 1982 (Mon) PB Daily News: Richard Gray, manager at the Gulf Service Station on South County Road, received the Raymond J. Kunkel Award for rescuing a woman who was pinned under a car after she was hit by the car on County Road and dragged. Mr. Gray received $1,000 and a plaque. Another attendant who assisted Mr. Gray, Francis Patenaude, was also recognized by the Kunkel Foundation. The woman who was rescued attended the awards ceremony. July 22, 1982 (Thurs) PB Daily News: Those at the April executive committee meeting of the Civic Association voted to support the fight for No Casinos in Florida, Inc. in opposing legalized casino gambling. Oct. 24, 1982 (Sun) PB Daily News: Raymond J. Moudry, the Palm Beach Civic Association’s beach erosion watchdog, presented a new method of beach restoration that he heard about at a recent seminar. March 21, 1983 (Mon.) Palm Beach Daily News: The day before a municipal election, the Civic Association took out a full-page ad urging residents to vote in favor of a $7 million bond issue to fund the construction of a new police station, renovations to the North Fire Station and construction of a new sewage compressor station in the north end. Voters overwhelmingly approved the bond issue. April 12, 1983 (Tues) Palm Beach Daily News: Town Manager George Frost said the town was in “good shape” at his annual State of the Town address at the Civic Association’s final meeting of the season. It was Frost’s 14th address to the association. Carl Mumm and the late Dr. Harold Strasser received the Kunkel Award. Mumm was cited for his crime prevention and Strasser posthumously received the award, after being killed while helping an injured accident victim. Frost lauded the Civic Association for helping the town “turn around” its zoning since 1970 and for supporting the town’s various bond issue elections. Civic Association President Doyle Rogers received a private sector initiative award from Sen. Paula Hawkins’ office for the association’s work in educating the residents on beach erosion and for work in crime prevention. Other topics that Frost spoke about included: town paramedics saved 15 people in 1982; 71 structures have been designated landmarks by the town so far with 47 of those pending; the “boot” placed on cars owing parking fines have brought in $237,000 in previously unpaid fines and the town has nearly a 100 percent ticket payment ratio; crime has fallen 25 percent in Palm Beach as compared to a national five percent reduction; police department turnover has dropped to a near zero rate in 1982; 22 lawsuits are ongoing against the town; the town is 70 percent through its storm sewer project; the town’s total property value has risen from $1.5 billion to $1.7 billion. Feb. 7, 1984 (Fri) PB Daily News: The Civic Association pledged $10,000 seed money for a Seascape pilot project to combat beach erosion. Dec. 9, 1984 (Sun) PB Daily News: The Civic Association donates $10,000 to the town’s new recreation center, which will have its ribbon cutting and grand opening in February. 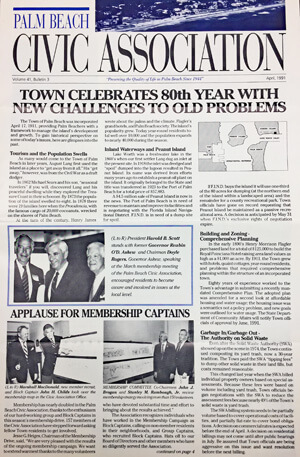 April 9, 1985 (Tues) PB Daily News: Town Manager Doug Delano delivered his first State of the Town message to members of the Civic Association. Among the highlights: the opening of the Recreation Center and the renovation of the Bradley Pavilion. Oct. 2, 1985 (Weds) PB Daily News: The Palm Beach County Commission unanimously passed two ordinances restricting noisy airplanes from departing at night from Palm Beach International Airport. The Civic Association sent a letter to the commission endorsing the ordinances. April 11, 1986 (Fri) PB Daily News: Town Manager Doug Delano told members of the Civic Association that the island’s parking problem is “unsolvable” during his annual State of the Town address on Thursday. Mr. Delano said the town is looking into ways to alleviate the parking crunch, but he said the probably would probably always exist. Regarding next year’s budget, Mr. Delano predicted an 11 percent increase in property taxes. It was the association’s last meeting of the season. Dec. 12, 1986 (Fri) PB Daily News: At Wednesday’s Civic Association meeting, CleaArtis Wiley, a professional golf caddy, was honored by the Raymond J. Kunkel Foundation for the heroism he displayed by rescuing a husband and wife from a car fire on North County Road. Mr. Wiley pulled the couple out of the car before it exploded. He received a $1,000 check from the foundation. Dec. 14, 1986 (Sun) PB Daily News: The Palm Beach Civic Association’s first membership meeting of the season drew a record crowd. Robert Lamb, Assistant Secretary of the U.S. State Department spoke about America at War with Terrorism. May 2, 1987 (Sat) PB Daily News: A consultant for the Civic Association will study whether there is any fat that can be trimmed from the Palm Beach Police Department’s $5 million budget. The police department accounts for one-fourth of the town’s $20 million budget. Last year, the Civic Association formed a 10-member Town Budget Review Committee, which eventually will scrutinize the budgets of all town departments. Aug. 6, 1987 (Thurs) PB Daily News: Doyle Rogers, president of the Civic Association, told a group of community leaders that the problems confronting the town today – crime, erosion and pollution – likely will pose challenges to town officials in years to come. Feb. 21, 1988 (Sun) PB Daily News: The Civic Association backs a “bottle bill” expected to be considered by the state legislature. The bill would require deposits on all bottles and cans as a way of cutting down on litter. April 11, 1989 (Tues) PB Post: Town Manager Bob Doney, appointed to the job in 1987, gave his second State of the Town address to the Civic Association. The town received a triple-A bond rating from Moody’s Investor Service, “a distinction enjoyed by no other municipality in Florida,” he said. During the 1987-88 season, about $17.9 million was raised for charities. The exterior restoration of Town Hall is expected to be finished in 60 days. 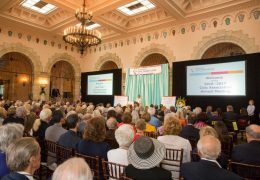 About $590,000 of the $725,000 needed for the project was raised by the Preservation Foundation of Palm Beach and its members. Feb. 23, 1990 (Fri) PB Daily News: Palm Beach Police add a seven-man motorcycle unit, increasing the annual budget by $140,000, after a rash of crimes caused concern on the island. Civic Association President Doyle Rogers said he thinks the new unit is a justified expense in the police budget. June 9, 1990 (Saturday) PB Post: Doyle Rogers, president of the Civic Association, sets the record straight in a letter to the editor, outlining the town’s efforts to provide public beach access and parking in a responsible way. The public parking inventory for the Mid-Town Beach Nourishment Project includes more than 800 spaces, most of which allow public parking free of charge, Mr. Rogers said. Oct. 6, 1990 (Saturday) PB Daily News: Mary Ratliff joins the Civic Association as executive director, succeeding Rise Jackson, who retired after 16 years with the association. Feb. 3, 1991 (Sunday) PB Daily News: The Palm Beach Civic Association sponsored a Town Council Candidates Forum held at St. Edward Parish Hall. Nov. 26, 1991 (Tues.) PB Daily News: Two-hundred members of the Civic Association rejected a proposal that would have given the board of directors the power to change the association’s charter. The change was voted down during the general membership meeting at the Royal Poinciana Chapel. March 6, 1992 PB Post: At the Civic Association’s March meeting, J. Timothy Killon Jr., planning committee chairman, said bids for the $1.6 million sewer project will be opened by the Town Council as soon as the bonds are validated. Storm and sanitary sewer installations from Southern Boulevard to the south town line will be worked on first to minimize traffic difficulties. Frank T. Quigley, port committee chairman, said representatives of the U.S. Army Corps of Engineers are at the port surveying the possibility of deepening the harbor to 35 feet. President Alfred G. Kay advised members to keep a close watch on their county tax valuations, which will be 60 percent of the county assessor’s opinion of properties’ actual value. A breakdown of county taxes will be sent to members. Sixty-six members and guests attended the tax equalization hearing in Town Hall. Oct. 3, 1993 PB Daily News: Ned Barnes joins Civic Association as executive director. He later becomes president. May 16, 1994 PB Daily News: The Civic Association celebrates 50 years with a Picnic and Pops Concert on May 22, 1994 at the Flagler Museum. 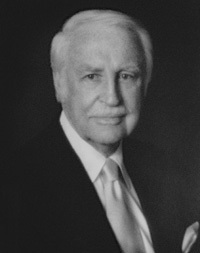 Harold B. Scott was chairman of the board. 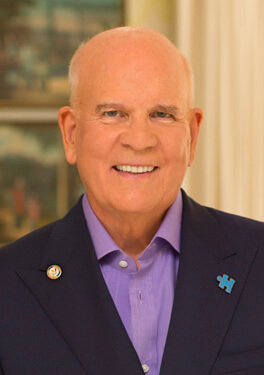 Louis C. Pryor was president and CEO. Nov. 20, 1994 PB Daily News: The Civic Association holds a 50th Anniversary Gala Dec. 7, 1994 at the Four Seasons Ocean Grand Hotel. Ann Appleman, Joanna Pryor, Barbara Rogers and Jane Scott were the co-chairwomen. Jan. 12, 1995 (Thurs) PB Daily News: The Civic Association, which leases space at 151 Royal Palm Way, moves to 230 Royal Palm Way later in the year. Feb. 25, 1995 (Sat.) PB Post: The Civic Association sponsors a forum on beach erosion. May 1995 (Weds.) 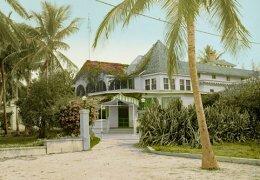 PB Post: The Palm Beach Civic Association and the Preservation Foundation of Palm Beach urged landmarking of the Kennedy Estate. John and Marianne Castle, prospective buyers of the former Winter White House, are resisting efforts to make it a landmark. The estate has been on the market for $7 million since Nov. 1993. The Kennedys have opposed 1980 and 1990 attempts to make the estate a landmark. Kennedy lawyers promised a lawsuit if the estate is landmarked and the Castle deal collapses as a result. June 4, 1995 (Sunday) PB Daily News: Palm Beach Civic Association opposed the proposed connector road between I-95 and Palm Beach International Airport – a $59 million project. Residents worry it will increase noise and traffic in the area and set the stage for airport growth. Oct. 12, 1996 (Sat.) PB Post: The Palm Beach Civic Association and the Preservation Foundation opposed Donald Trump’s request to lift limits on membership, traffic, guest suites and other items at his Mar-a-Lago Club. Both groups feared it would bring more traffic and further commercialize the 17-acre estate, which is in a residential area. March 22, 1998 (Sun) PB Daily News: The Civic Association and the Citizens Association issued a joint statement that Palm Beach should obtain a water supply that is highly dependable and competitively priced after their supplier, West Palm Beach, imposed a 25 percent surcharge. They noted that West Palm Beach is a monopoly, but has a plentiful source of good-quality water. They urged the Town Council to seek a solution where Palm Beach supplies its own water. It was the first time the two groups issued a joint position. March 31, 1998 (Tues.) PB Daily News: The Civic Association mounts a campaign to encourage pet owners to clean up their pet’s waste in public places. The association declares April “Pick Up After Your Pet Month” and offered 1,000 disposal bags and scoops at 20 locations around the island. April 21, 1998 (Tues) PB Daily News: Mayor Paul Ilyinsky delivered his State of the Town address at the Palm Beach Civic Association’s Annual Meeting. The mayor touched on the most pressing issues facing the town, including the possible pending failure of the Royal Park Bridge and the urgent need for a new one. He also spoke about town’s opposition to the expansion of Palm Beach International Airport. The mayor also said it was time to consider building a desalination plant to break the town’s dependence on West Palm Beach for water. April 20, 1999 (Tues) Palm Beach Post: In his State of the Town address, Mayor Paul Ilyinsky said traffic will be even more congested with Neiman Marcus coming to Palm Beach, CityPlace opening in West Palm Beach and the reconstruction of the middle bridge. The upcoming presidential campaign will keep traffic gridlocked as candidates come to the island to gather campaign donations from wealthy Palm Beachers, he said. Oct. 14, 1999 (Thurs) PB Post: The Town Council approved an expansion at Donald Trump’s Mar-a-Lago Club, allowing him to build a $10 million, 17,000-square-foot pavilion and increase maximum attendance at events from 390 to 700 people. The Civic Association fought the changes, saying it would convert Mar-a-Lago into a nightclub. Dec. 2, 1999 (Thursday) PB Daily News: The Town Council approved a $42.5 million plan for dumping sand on most of its beaches from Onondaga Road to town’s southern border. The Civic Association supported the plan. Jan. 11, 2000 (Tues) PB Daily News: Restoration of the town’s eroded beaches and the expansion of Donald Trump’s Mar-a-Lago Club dominated the questions asked of the Town Council candidates at a forum sponsored by the Civic Association. Feb. 6, 2000 (Sun) PB Daily News: The Civic Association supports Tuesday’s referendum that would change the town’s charter. The most significant change gives the town manager authority to hire and fire department heads without the council’s approval. Voters approved the charter revisions on Feb. 8, 2000. April 6, 2000 (Thurs.) PB Daily News: The Civic Association teams up with Palm Beach Day School and Keep Palm Beach County Beautiful, Inc. for a beach cleanup. It’s the first time the Civic Association and the Day School have united in a community effort. April 18, 2000 (Tues.) PB Daily News: Mayor Lesly Smith delivered her first State of the Town address before more than 200 people at the Palm Beach Civic Association’s annual meeting at the Royal Poinciana Chapel. She challenged residents to ensure that Palm Beach gets it’s share of resources from the county and the state. She mentioned the accomplishments of the past year, including passage of the $42.5 million beach restoration plan, which was supported by the Civic Association. The association gave the annual Raymond J. Kunkel Award to five Bath and Tennis Club employees who helped save the life of an 81-year-old man. The group presented its annual Beautification Award to Addison Development for its work on Phipps Estate on North County Road. June 8, 2000 (Thurs.) PB Daily News: When a consulting firm recommends closing St. Mary’s Medical Center and keeping Good Samaritan Medical Center open in a consolidation effort, the town and residents want both hospitals kept open. Civic Association President Ned Barnes said the Civic Association and other community groups should be involved in the hospitals’ future. Ultimately, both hospitals remained open. May 9, 2001 (Weds) PB Daily News: The Town Council okays a plan for 30 upscale condominium units at the site of the former WPBR radio station at 3000 S. Ocean Blvd. The Civic Association favored the project. Oct. 21, 2001 (Sun) PB Daily News: More than 50 volunteers of all ages turned out for a beach cleanup sponsored by the Civic Association and Keep Palm Beach County Beautiful. The two groups sponsor beach clean ups twice a year. Nov. 10, 2001 (Sat) PB Daily News: Topics of the Civic Association’s second community forum of the season included terrorism, feral cats and the development of a 10-year strategic plan. Oct. 27, 2002 (Sun) PB Daily News: Candidates vying for a seat in U.S. Congress and the Florida Senate will face off in a forum hosted by the Civic Association. March 1, 2003 (Sat) PB Daily News: Peruvian Avenue Park is dedicated. The Civic Association’s Beautification Committee helped jump-start the project. April 15, 2003 (Tues) PB Post: Mayor Lesly Smith delivered her annual State of the Town address to more than 250 members of the Civic Association. Preparation for a terrorist attack is a top priority. Road reconstruction, drainage improvements and beach restoration are underway, she said. May 6, 2003 (Tues) PB Daily News: The Civic Association organized a letter-writing campaign to get behind a legislative bill that would allow hospitals without open-heart surgery programs to perform emergency angioplasties. Sept. 11, 2003 (Thurs) PB Post: The Palm Beach Civic Association will hold a free Hurricane Preparedness Seminar at The Colony. Sept. 21, 2003 (Sun) PB Daily News: During a discussion about the over-abundance of variances requested and granted, a lawyer for the Palm Beach Civic Association told the Town Council that it should consider a review of the zoning code to make it more flexible, rather than use – or misuse – variances to create flexibility where it does not really exist. Oct. 14, 2003 (Tues) PB Post: After an impasse on wage and benefit negotiations with the town, unionized members of Palm Beach firefighters handed out fliers and waved posters outside a monthly luncheon meeting of the Civic Association. The fliers said that the town’s proposal will lead to employee turnover. Nov. 4, 2003 (Tues) PB Post: On behalf of the Civic Association, Chairman Bill Guttman urged the Palm Beach County legislative delegation to reduce the time for obtaining signatures to get a constitutional question on the ballot from four years to one year and require 66 percent of the voters to pass a constitutional amendment. It’s too easy to put a constitutional question on the ballot, he said. Feb. 1, 2004 (Sun) PB Post: During a divisive Town Council campaign that mixed religion and politics, the Civic Association bought a full-page ad in the Palm Beach Daily News to rebut William Cooley’s verbal attacks on sitting council members and on the Civic Association. Feb. 3, 2004 (Tues) PB Daily News: The Civic Association has arranged for free transportation to registered voters who have no way to get to the polls for today’s Town Council election. March 4, 2004 (Thurs) PB Daily News: The Palm Beach Civic Association and town officials have welcomed a U.S. Coast Guard proposal to implement a permanent schedule of timed drawbridge openings in the county. But town officials and the association are unhappy with the Coast Guard’s refusal to prohibit bridge openings during rush hour to help ease traffic congestion. April 20, 2004 (Tues) PB Daily News: In her State of the Town address to 300 members of the Civic Association, Mayor Lesly Smith urged residents to patronize businesses on Royal Poinciana Way during upcoming road improvements. The Town Council also is contemplating development of a long-term plan for burial of utility wires. Cost estimates are as high as $70 million and should go to a voter referendum for approval, Mayor Smith said. May 23, 2004 (Sun) PB Daily News: A bill allowing hospitals without an open-heart program to perform emergency angioplasty passed the 2004 legislative session. The Civic Association and Town Council endorsed the bill. Oct. 19, 2004 (Tues.) PB Daily News: The owner of Royal Poinciana Plaza and two developers want the town to amend the zoning code in order to redevelop the site as a mixed-use residential with 75-85 luxury condominiums. Civic Association CEO and co-chairman Bill Guttman questioned whether the commercial zoning should be changed. He said the burden is on the owner and developers to show the plaza cannot be restored as strictly commercial. Dec. 7, 2004 (Tues) PB Daily News: After eight years as CEO and co-chairman, Bill Guttman will step down in April and be succeeded as CEO by Co-Chairman Stanley M. Rumbough, Jr.
Feb. 21, 2005 (Mon) PB Daily News: An independent report, paid for by the Civic Association, concluded that the town should consider a more flexible zoning code with clear guidelines for variances. The report spurred the Town Council to schedule a special meeting to address the issue. April 19, 2005 (Tues) PB Daily News: Giving his first State of the Town address since his February election, Mayor Jack McDonald said he is concerned about the spillover effect from increased development on Flagler Drive, especially regarding traffic. The results of a town survey show residents main concerns are about traffic, parking and road construction. Mayor McDonald gave his remarks during the Civic Association’s Annual Meeting, where outgoing CEO Bill Guttman passed the gavel to new CEO Stanley M. Rumbough, Jr.
August 11, 2005 (Thurs) PB Daily News: The Palm Beach Civic Association hires an expert to conduct a study on underground utility conversion. Sept. 20, 2005 (Tues) PB Daily News: The Palm Beach Civic Association opposes former Mayor Yvelyne “Deedy” Marix’ attempt to restore the Town Council’s power to approve the hiring and firing of department heads. The association said it’s better to leave the power to hire and fire department heads in the hands of the town manager. Jan. 9, 2006 (Mon) PB Daily News: The Civic Association partnered with the Palm Beach Police, Citizen’s Association of Palm Beach and the American Red Cross to post informational signs, alerting swimmers of the danger of rip currents and offering safety tips. Jan. 10, 2006 (Tues.) PB Daily News: The Civic Association hosted a Candidates’ Forum, where incumbent Councilman Norman Goldblum and challenger Susan Markin discussed issues facing Palm Beach. Feb. 8, 2006 PB Post: Voters soundly rejected a charter amendment that would have given Town Council approval over the hiring and firing of department heads. The Civic Association sent out a town-wide mailer and bought a full-page ad to help defeat the charter amendment. March 1, 2006 (Weds) PB Daily News: The Civic Association has agreed to pay $13,000 to fund a town-wide survey designed to assess the medical needs of residents on the island for the Medical Care Commission. April 9, 2006 (Sun) PB Daily News: An idea that originated with the Civic Association for countdown signals at crosswalks came to fruition as the town installed one at South County Road and Worth Avenue with others to follow. October 21, 2006 (Sat) PB Daily News: The Civic Association hosted a debate between incumbent U.S. Rep. E. Clay Shaw and the Democratic challenger for his congressional seat, Sen. Ron Klein. Mr. Klein ultimately unseated Mr. Shaw. Nov. 14, 2006 (Tues) PB Daily News: During a Civic Association Forum, Deputy Town Manager Tom Bradford estimated the cost for town-wide undergrounding at $60.3 million. The estimate is a key piece of information for voters who will be asked to approve or reject a general obligation bond issue for underground utilities in a Feb. 6 referendum. Jan. 23, 2007 (Tues) PB Daily News: The Palm Beach Civic Association hosted a community forum, where Palm Beach elected officials pledged to do their best to obtain state and federal environmental permits, so the town can rebuild severely eroded coastline in the South End. Jan. 30, 2007 (Tues) PB Daily News: The Palm Beach Civic Association and the Flagler Museum hosted a community forum with members of the Palm Beach County legislative delegation. The lawmakers listened to residents and elected officials concerns. Topping the list: property tax reform. April 17, 2007 (Tues) PB Daily News: In his State of the Town address during the Civic Association’s Annual Meeting, Mayor Jack McDonald noted the violent crime rate in neighboring communities had gone up; while Palm Beach has remained a safe place to walk around in 24 hours a day. May 9, 2007 (Wed.) PB Post: With a 25 percent credit from Florida Power & Light, the Town Council decided Tuesday to push forward with a town-wide referendum Feb. 5 to decide whether to bury its power, telephone and television cable lines. The 10-year project, estimated at $77 million, would cost town taxpayers $63 million. Aug. 9, 2007 (Thurs) PB Daily News: The Civic Association urged the town to cancel a Jan. 29 referendum on whether to bury the town’s utility lines, fearing voters will reject $65 million worth of borrowing needed to pay for it. The utilities referendum would take place just six weeks after voters are asked on Dec. 18 to approve the sale of $28 million in bonds to pay for South End beach restoration and storm drainage work in the North End. On Aug. 14, the Town Council rejected the association’s request and decided to keep the Jan. 29 referendum date. Nov. 14, 2007 (Weds) PB Post: The Town Council asked the Civic Association to create a committee to explore alternatives to buying water from West Palm Beach, including desalination and reverse osmosis of ocean water. The council lamented the water quality and use restrictions. Jan. 20, 2008 (Sun) PB Daily News: The directors of the Civic Association took out a full-page ad in the Shiny Sheet, urging the Town Council not to reduce programs, staff and services during a budget review, where the town was identifying cuts across the board. Jan. 29, 2008 (Tues) PB Daily News: The Palm Beach Civic Association sponsored a Candidates’ Debate between incumbent Councilman Bill Brooks and challenger David Rosow. March 12, 2008 (Weds) PB Daily News: Palm Beach Police voted down a bid to unionize. Both the Civic Association and the Citizens’ Association sent letters of support to the police and urged them not to unionize. April 15, 2008 (Tues) PB Daily News: The securing of nearly $2 million in federal funds to rehabilitate the sand transfer plant is the biggest news of the year in Palm Beach, said Mayor Jack McDonald in his State of the Town Address at the Civic Association’s Annual Meeting. May 9, 2008 (Fri) PB Daily News: The results of a survey by the Palm Beach Chamber of Commerce – in partnership with the Civic Association and the Citizens’ Association – showed that a majority of respondents want businesses on the island and 90 percent support having people cross the bridge to dine and shop here. Aug. 17, 2008 (Sun) PB Daily News: Councilwoman Susan Markin and Port of Palm Beach Commissioner George Mastics both used the Civic Association’s email list to send their opposing views regarding port expansion to 800 members of the association. Ms. Markin objected to port expansion; while Mr. Mastics defended expansion. Nov. 9, 2008 (Sun) PB Daily News: In an opinion piece published in the Palm Beach Daily News, Civic Association Co-Chairmen Stanley M. Rumbough, Jr. and Stephen L. Brown said the Civic Association believes that Sterling Palm Beach’s plan for redevelopment of the Royal Poinciana Plaza has merit and deserves further study. April 27, 2009 (Mon) PB Daily News: A Civic Association analysis found that median household water use in Palm Beach is quadruple the amount consumed by the average Florida household. To address the problem, the town is gearing up for a public education campaign to encourage conservation. May 9, 2009 (Sat) PB Daily News: The results of a Civic Association survey asking residents what they think should happen to the main post office shows that residents don’t want the town to buy it. August 13, 2009 (Thurs) PB Daily News: The town and the Civic Association have partnered in a pilot program through which volunteer participants will install “smart irrigation” controllers to limit water use. A Civic Association study found that smart irrigation controllers can reduce water consumption by more than 40 percent. Oct. 15, 2009 (Thurs) PB Daily News: The Civic Association held a flu forum to educate residents on the H1N1 influenza virus and the vaccine to combat it. Oct. 30, 2009 (Fri) PB Daily News: The Civic Association held a finance forum where Councilman Robert Wildrick said that high salaries and benefits for town employees will generate a $75 million deficit for the town by 2018 if changes aren’t made. Nov. 7, 2009 (Sat) PB Daily News: Sterling Palm Beach, operator of the Royal Poinciana Plaza, will unveil its new redevelopment plan at a forum sponsored by the Palm Beach Civic Association. It was one in a series of forums held by the Civic Association regarding the future of the plaza. Nov. 9, 2009 (Mon) PB Daily News: The Civic Association is advocating a review of the entire town charter and the council is set to consider appointing a charter review commission. Nov. 30, 2009 (Mon) PB Daily News: The Civic Association offered free H1N1 vaccines to high-risk individuals. Jan. 26, 2010 (Tues) PB Daily News: The Civic Association holds a debate for the upcoming Town Council election. Development, shore protection, budget, taxes and the future of Royal Poinciana Plaza dominated the dialogue. Incumbent David Rosow faces a challenge by Cynthia Simonson, while Jeff Cloninger challenges incumbent Richard Kleid. Mr. Rosow and Mr. Kleid both reclaimed their seats. Feb. 23, 2010 (Tues) PB Daily News: The Civic Association holds a forum where town officials addressed some of the most frequently asked questions regarding the town’s beach protection program. March 10, 2010 (Tues) PB Daily News: Former NBC executive Bob Wright has been selected as the new chairman and CEO of the Civic Association. Mr. Wright succeeds Stephen Brown, who announced last month he was stepping down. March 21, 2010 (Sun) PB Daily News: The Civic Association hosted a public forum regarding government taxes and spending, a hot topic among residents. Councilman Robert Wildrick and Palm Beach County Administrator Robert Weisman were the speakers. April 7, 2010 (Weds) PB Daily News: Pat Cooper, chairman of the Civic Association’s finance and taxation committee, told the Town Council that the town must address long-term pension costs for employees. The council will decide whether to approve Town Manager Peter Elwell’s plan to drastically cut employees’ pension benefits to address projected budget deficits. Employees spoke out against the plan. May 9, 2010 (Sun) PB Daily News: The Civic Association has joined Palm Beach County business leaders in opposing a proposed sales tax increase to pay for Palm Beach County emergency services. August 12, 2010 (Thurs) PB Daily News: The Civic Association conducts a survey to determine if residents like the proposed design for an expanded and renovated Publix. Seventy-seven percent of respondents approved of the size and design. October 19, 2010 (Tues) PB Daily News: A Civic Association debate between Democratic incumbent U.S. Rep. Ron Klein and Republican challenger Allen West drew a standing-room-only crowd. Mr. West won the seat in the Nov. 2 election. October 31, 2010 (Sun) PB Daily News: Civic Association Chairman and CEO Bob Wright urged residents to vote “no” on a county amendment that would expand the authority of the county ethics commission and inspector general. Mr. Wright said it will be an added cost to taxpayers and Palm Beach has its own internal controls to guard against ethics violations. He also recommended voting “no” on another amendment that calls for voter approval of all changes to local comprehensive land-use plans. Nov. 11, 2010 (Thurs) PB Daily News: The Civic Association organizes a sponsorship campaign for centennial-themed banners that will be displayed on town lampposts between January and April 2011 for the town’s centennial celebration. Feb. 1, 2011 (Tues) PB Daily News: Mayor Gail Coniglio told a Civic Association symposium that town officials must decide between a tax increase or budget cuts that would diminish services. She wants to hear from the community to see what residents want. March 2, 2011 (Weds) PB Daily News: Police officers shouldn’t have to suffer drastic cuts to their pensions, the leader of the county’s Police Benevolent Association told 100 people at a Civic Association forum on proposed employee pension reforms. April 5, 2011 (Tues) PB Daily News: Finances and taxes were the top issues in Mayor Gail Coniglio’s first State of the Town address as mayor during the Civic Association’s Annual Meeting. April 30, 2011 (Sat) PB Daily News: The Civic Association will pay half of the $20,000 cost for a Florida TaxWatch study of the Palm Beach County budget. Mayor Gail Coniglio chairs the County Budget Tax Force, which requested the study. The task force was created last year to research the county budget and pressure county commissioners to control expenses and avoid tax increases. Also: The Civic Association opposed an effort by the Palm Beach Maritime Museum to build a 150-seat restaurant on Peanut Island. Some town residents said it would increase traffic to the small island and increase noise pollution. May 1, 2011 (Sun) PB Daily News: Results of an informal Civic Association survey regarding public restrooms at Midtown Beach show a majority of residents favored the restrooms. July 8, 2011 (Fri) PB Post: The Civic Association urged the Palm Beach County commissioners to hold the line on taxes with no tax millage increase for the budget year of 2012. Aug. 7, 2011 (Sun) PB Daily News: The Civic Association went live this week with its “Eye on Palm Beach” web camera, which is trained on the construction site of Publix. Once the exterior work to the supermarket is finished, the camera will focus on construction of the new Flagler Memorial Bridge. Dec. 22, 2011 (Thurs) PB Daily News: The Civic Association said that the north side of Royal Poinciana Way is shabby and needs improvement, but the Testa’s overlay proposal seeks too many residential units. Jan. 20, 2012 (Fri) PB Daily News: Public Safety Director Kirk Blouin told a Civic Association gathering that “morale is at an all-time low” in the police and fire departments due to the council’s decision to cut pensions. At the end of the day, people are expected to do their jobs, he said. Feb. 16, 2012 (Thurs) PB Daily News: The Civic Association does not endorse the Testa’s redevelopment plan as proposed. Increasing density from six to 24 goes too far, said Ned Barnes, president of the association. March 6, 2012 (Tues) PB Daily News: Veteran broadcast journalist Tom Brokaw was the keynote speaker at the second annual Palm Beach Civic Association Awards Luncheon. April 5, 2012 (Thurs) PB Daily News: Palm Beach Fire-Rescue, along with the Civic Association and the Sudden Cardiac Arrest Association, is developing a plan to encourage local businesses, organizations and residents to buy Automated External Defibrillators to keep on site for cardiac emergencies. May 1, 2012 (Tues) PB Daily News: The Civic Association is gathering opposition to a proposed half-cent increase in the sales tax. Oct. 7, 2012 (Sun) PB Daily News: A Palm Beach Civic Association study shows that Palm Beach police and fire-rescue do an excellent job protecting residents despite budget cutbacks caused by the economic downturn. Dec. 17, 2012 (Mon) PB Daily News: The Civic Association organized a charter bus tour of the town’s shoreline for residents to view the erosion from Hurricane Sandy. Feb. 20, 2013 (Weds) PB Daily News: The Civic Association holds a community forum on the Affordable Care Act, known as Obamacare. March 17, 2013 (Sun) PB Daily News: The Civic Association and the town ask residents to send emails to the governor and the FDOT to keep the Flagler Memorial Bridge open during construction of the new bridge. March. 28, 2013 (Thurs) PB Daily News: The Palm Beach Fellowship of Christians & Jews honored Bob Wright and the Civic Association at the fellowship’s annual dinner for their contributions to the community. June 9, 2013 (Sun) PB Daily News: The Civic Association urged the Town Council to reconsider its decision to terminate the Planning and Zoning Commission. July 7, 2013 (Sun) PB Daily News: The Civic Association endorsed a proposed ordinance where residents who install town-approved advanced irrigation systems will be exempt from day-of-the-week watering restrictions. Those systems would save billions of gallons of water and millions of dollars annually. Oct. 10, 2013 (Thurs) PB Daily News: The Civic Association supports the PUD-5 plan for redeveloping Royal Poinciana Way. Voters ultimately rejected the zoning changes in March 2014. Oct. 16, 2013 (Wed) PB Daily News: The Civic Association and the Palm Beach Police Foundation sponsor the annual employee appreciation picnic at the Recreation Center. Jan. 31, 2014 (Fri) PB Post: The Civic Association’s port committee sent out a letter to members, saying they are monitoring the new tenant at the Port of Palm Beach, Stonerock Shipping. The company is exporting scrap metal from the port. Some residents worry that the port is becoming a scrapyard. April 18, 2014 (Weds) PB Post: The Civic Association, now 2,000 members strong, opposes the U.S. Army Corps of Engineers’ proposal to deepen and widen the Lake Worth Inlet. The plan would increase the Port of Palm Beach’s outer and inner channel and would increase the maximum ship length allowed in the port. May 2, 2014 (Fri) PB Daily News: The Civic Association asks its members to send a letter to legislators in Tallahassee, urging them to not include funds in the state budget for deepening and widening the Lake Worth Inlet. Jan. 13, 2015 (Thurs) PB Daily News: The Civic Association holds a Town Council Candidates’ Debate. Michael Scharf is attempting to unseat Michael Pucillo and Danielle Moore is challenging Bill Diamond. Mr. Pucillo and Ms. Moore win their respective campaigns. Feb. 26, 2015 (Thurs) PB Daily News: The Civic Association distributed 7,000 pet decals. The decals are placed on houses to alert emergency responders regarding the number of pets in a household that need to be rescued during home emergencies, such as a fire. March 12, 2015 (Thurs) PB Daily News: Civic Association President Ned Barnes urged council members to defer the fate of Uber on the island until they’ve heard the county’s decision. A recent Civic Association survey revealed 90 percent of those surveyed supported the ride-sharing app. The council agreed to wait. April 19, 2015 (Sun) PB Daily News: The Civic Association gives the Raymond J. Kunkel Award for heroism to Michael Reiman, who came to the aid of Jeremy Holland. Mr. Holland was shot in the head by a disgruntled former employee in the lobby of The President of Palm Beach condominium. Mr. Holland survived the shooting. May 17, 2015 (Sun) PB Daily News: The Civic Association pledges $10,000 to the $1 million Town Hall Square renovation project. Aug. 13, 2015 (Thurs) PB Daily News: The Civic Association sends a letter to the legislative redistricting committee, requesting that the coastal communities be kept together, because any issues on the ballot related to waterways would directly impact coastal residents and voters. Nov. 15, 2015 (Sun) PB Daily News: The Civic Association sponsors an underground utilities forum to answer residents’ questions about the proposed town-wide project to bury overhead power, cable television and phone lines. Voters are being asked to approve a bond issue of up to $90 million in a March 15 referendum. The referendum passed. Jan. 26, 2016 (Sun) PB Daily News: Civic Association Chairman Emeritus Doyle Rogers dies. March 31, 2016 (Thurs) PB Daily News: The Civic Association and the Palm Beach Police Foundation paid for a study of the town’s public safety retirement benefits. The study showed that the town’s retirement benefits are 50 to 65 percent lower than those offered by the majority of comparable area departments. Aug. 28, 2016 (Thurs) PB Daily News: The Civic Association partnered with the Citizens’ Association and the town to provide information on how best to keep residents safe from the Zika virus. Sept. 22, 2016 (Thurs) PB Daily News: The Town Council approved the Civic Association’s donation of 29 Christmas palms on North County Road from Royal Poinciana Way to Park Avenue. The cost is $28,000. Oct. 30, 2016 (Sun) PB Daily News: The Civic Association held a Candidates Meet and Greet, which included explanations of a county ballot question and constitutional amendments. Dec. 5, 2016 (Mon) PB Daily News: Town Engineer Patricia Strayer updated the Civic Association’s transportation committee on what projects have been finished and which ones are ongoing, including the Flagler Memorial Bridge nearing completion. Jan. 24, 2017 (Tues) PB Daily News: The Civic Association hosts a debate with Town Council hopefuls Julie Araskog and Martin Klein. Ms. Araskog won the Feb. 7 election. Jan. 29, 2017 (Sun) PB Daily News: The Civic Association supports Mayor Gail Coniglio and the Town Council in their efforts to promote the use of reusable shopping bags instead of plastic ones. March 17, 2017 (Fri) PB Daily News: The Town Council accepted the Palm Beach Civic Association’s offer to pay half – up to $50,000 – for a professional review of the town’s plan for burying all utilities on the island. The peer review will assess the scope, construction methods and cost estimates laid out by the town’s engineering consultant Kimley-Horn & Associates. June 8, 2017 (Thurs) PB Daily News: Civic Association Chairman Emeritus Harold B. Scott dies. He was a former U.S. Assistant Secretary of Commerce. Oct. 1, 2017 (Sun) PB Daily News: Stanley M. Rumbough, Jr., former chairman and CEO of the Civic Association, dies. Through the generosity of Mr. Rumbough’s family, the Civic Association established the Stanley M. Rumbough, Jr. Legacy Society, which will help to ensure the association’s long-term fiscal stability. Feb. 28, 2018 (Weds) PB Daily News: The Civic Association holds a Candidates Forum with Harris Fried and Lew Crampton who are vying for the Group 1 Town Council seat held by the retiring Richard Kleid. Mr. Crampton won the March 13 election. March 3, 2018 (Sat) PB Daily News: The Civic Association supplied 2,000 reusable fabric grocery bags that were handed out by Oxbridge Academy students to shoppers at the Palm Beach Publix. March 17, 2018 (Sat) PB Daily News: The Civic Association hosts a “Live to be 100 with a High-Quality Palm Beach Lifestyle” forum. April 17, 2018 (Tues) PB Daily News: Mayor Gail Coniglio delivers her State of the Town address, reiterating the need to trim costs in the budget. April 27, 2018 (Fri) PB Daily News: The Civic Association and other entities, including the town, are hopeful that the Port of Palm Beach can secure grant money to restore the John F. Kennedy bunker, former Coast Guard station and boathouse on Peanut Island. Oct. 9, 2018: The Town Council approved the Civic Association’s donation of 75 coconut palms to the town in honor of the association’s 75th Anniversary season. 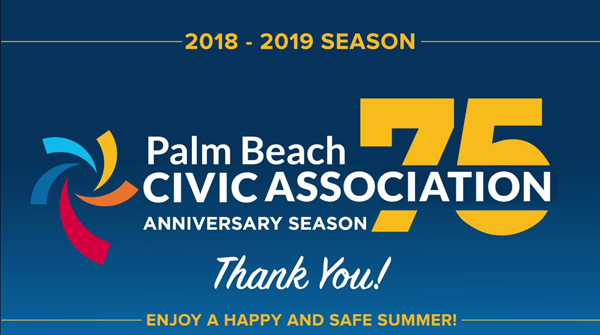 Nov. 26, 2018: The Palm Beach Civic Association kicks off its 75th Anniversary Season with a reception hosted by the Royal Poinciana Plaza.